How many times have you found yourself sitting at a bar with friends, or at a theater or lonely hotel room wishing you could order a bite to eat that doesn’t require Googling nearby restaurants or hopping in a car? According to the unconventional meal delivery service 2ndKitchen, that struggle to feed the foodless masses is real—and the foundation for a delivery platform connecting bars, restaurants, hotels and luxury condos with nearby restaurants that can use a courier or send a server walking down the block to deliver meals to customers at establishments without kitchens. For anyone familiar with the food scene at breweries and distilleries, think of 2ndKitchen as a food truck without the truck, or the annoying process of standing in line and then waiting outside for your name to be called. One of three co-founders of the business that started as a class project at Chicago’s Kellogg School of Management, Anastasiades said 2ndKitchen is a way for bars and other drinking establishments without their own kitchens to hang onto their customers, rather than sending them into the night to fend for themselves in search of a burger or pizza. After Anastasiades redefined the business plan with two of his longtime friends and business partners, and launched the service at a brewery in Evanston, Illinois, the company received dozens of orders that first day without doing any marketing or any other promotions. 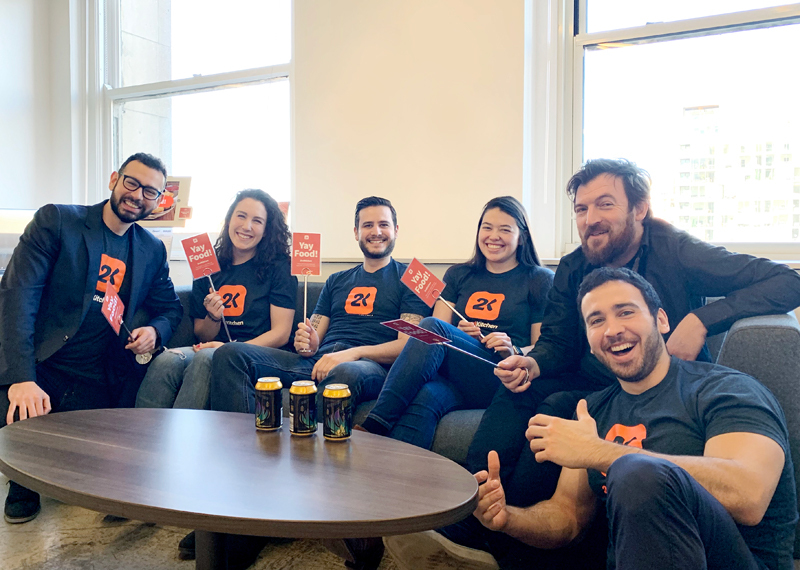 From there, they entered the company in the Techstars business accelerator program and expanded the idea by focusing exclusively on the greater Midwestern market after launching in July 2018. Now more than a year old, 2ndKitchen just received $1.35 million in seed money, led by Hyde Park Ventures. With that stack of cash, Anastasiades is now focusing on rapid growth and setting the company up for national expansion. Part of that next phase revolves around automating the matchmaking process, which is currently done manually and requires the company to have staffers on the ground in each market. Without divulging specifics, Anastasiades said the company charges the bar, hotel or other establishment a fee that he claimed is about a third of traditional third-party delivery providers. The end user/eater also pays a nominal fee for the service. While food trucks have already cornered the market, at least for bars, breweries, distilleries and other hip outdoor events, 2ndKitchen believes its offering is compelling enough that many establishments could end their contracts with food trucks, which Anastasiades said can be cumbersome for businesses to schedule, maintain and integrate into their own financials. Anastasiades believes another part of the appeal for 2ndKitchen customers is the ability to create a rotating menu such as taco Tuesdays, ramen Wednesdays or breakfast burritos for weekend brunch, as a few examples. Asked why restaurants wouldn’t contact these establishments on their own, or vice versa, Anastasiades said 2ndKitchen provides the menus, table numbers, and relationship management that makes the process as easy as possible for all parties. He also said because serving food is inherently a hassle, with inevitable special requests and kitchen mix-ups, 2ndKitchen is designed to handle all of the “friction points” between the two businesses. In concept, a participating restaurant dedicates a server to the outside business that functions like other tables in his or her section, but with only one “table touch” to bring the food—and the hope that tips will be included like a traditional restaurant meal. For restaurants planning to walk food to the nearby establishment, the goal is connecting businesses that are within a third of a mile for each other, although bike couriers or even last-mile providers like Postmates and DoorDash can expand that radius for partner restaurants.